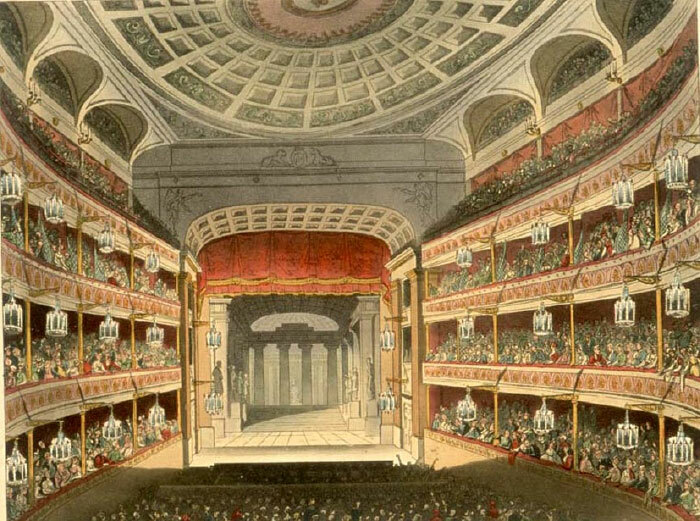 Thomas Rowlandson and Augustus Charles Pugin, New Covent Garden Theatre (1810). Plate 100 of Rudolph Ackermann, The Microcosm of London; or, London in Miniature, 3 vols. (London: T. Bensley, 1808-10), 1: 262-63. This building opened in 1809 to replace its predecessor, which had burned down in 1808. The image depicts the third tier of boxes as well as the “pigeon holes” above the gallery. Courtesy of the Thomas Fisher Rare Book Library, University of Toronto.